What’s on Your Nightstand? happens on the FOURTH Tuesday of every month. It’s a great chance to let others know what you like to read, and to find new bloggers with the same taste in books as you have. 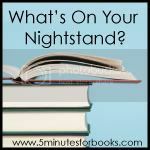 View past editions of What’s on Your Nightstand? HERE. I hope that you’ll join us the FOURTH Tuesday of each month. Publish a post on your on blog that day, link to our site letting others know about the carnival, and then enter the direct link to your post here at the Linky on our post, so that everyone can click through and find out what everyone else is reading. To give everyone a shot at being at the top of the linky, we’ll post it at midnight Eastern on odd numbered months and at 8:00am Eastern on even numbered months. Feel free to post the button in your sidebar or use it in your post.